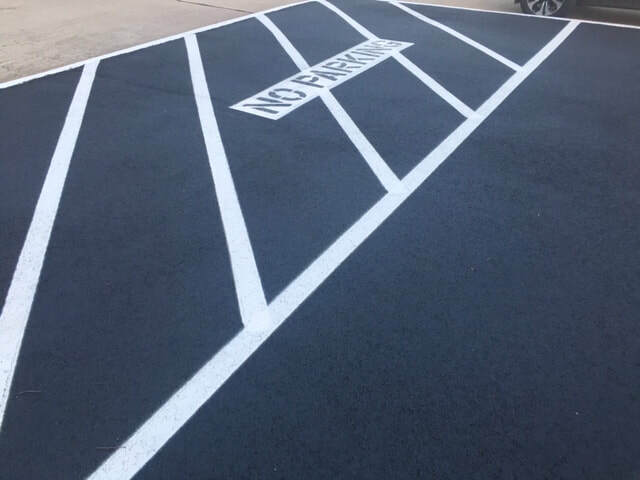 Parking lot striping Nashville prides itself on satisfying customers with quality line painting and striping, and parking lot maintenance services! Have the outdoor elements, traffic or oil spills damaged your parking lot? Are the lines starting to fade or chip? We are ready to assist you today. Along with the latest equipment and a highly-skilled crew, we can fulfill any request quickly, neatly and competently. Whether you need line striping or sealcoating, rely on our expertise! We also offer competitive rates! Our striping crews have extensive knowledge and experience in re-striping your lot or striping it for the first time. We work closely with you to make sure that your parking lot meets all standards with county, city, state and federal regulations. Marked stalls, handicap spaces, and directional arrows all make for a more efficient and problem-free parking lot. They are a critical element in maximizing parking lot space and smoothing the flow of lot traffic. Please call us today at (615) 610-3314 to learn more about our services and to get a FREE estimate. We will ensure that your parking lot is both safe and nice looking. Over time, outdoor elements deteriorate your parking lot. Because the paint is exposed to the outdoor features, there’s an overwhelming amount of grime and micro-bacteria that gets caught onto your parking lot from foot and vehicular traffic, weather and other everyday factors that cause wear and tear. As a Tennessee parking lot maintenance company we understand that keeping your businesses attractive is a top priority. Parking lot striping Nashville, TN is a full-service parking lot maintenance solutions provider. We cater to all businesses, including commercial parking lots, retail chains, malls, strip malls, retail shopping centers, real estate developers, facility operations managers, restaurants and paving contractors. We do work with both asphalt and concrete parking lots and have experience with all aspects of services you need for your parking lot. No matter the size of job you have, we can assist. We primarily use environmentally friendly water-based paint that assures you that your line will not yellow as it ages like oil-based paint. The water-based paint dries relatively quickly, usually within ten minutes of application. Oil-Based paint is occasionally used (depending on the season and upon request) which takes around 60 minutes to dry. Glass beads can be added for a more reflective purpose if necessary. We also understand that your business traffic is significant, and cannot be disrupted. We will work with you and your management staff to schedule the best times for us to come out and do the planned striping or maintenance. We will make sure that we do not disturb your traffic flow and will work within your schedule. The good news is that once we have the lot or a section of the lot free of vehicles and debris, we can start striping that one part. The high-quality paint that we use does dry quickly, so we do not have to leave the parking lot blocked off for too long of a time. We provide striping for both concrete and asphalt parking areas. Have you ever had the dreaded visit from the local fire marshal? If so call us today and our professional stripers will get your parking lot back into compliance. We stay up on all the local fire codes and make sure your business is providing the safety necessary to allow for emergency vehicle access (Fire, Police, and Ambulance). 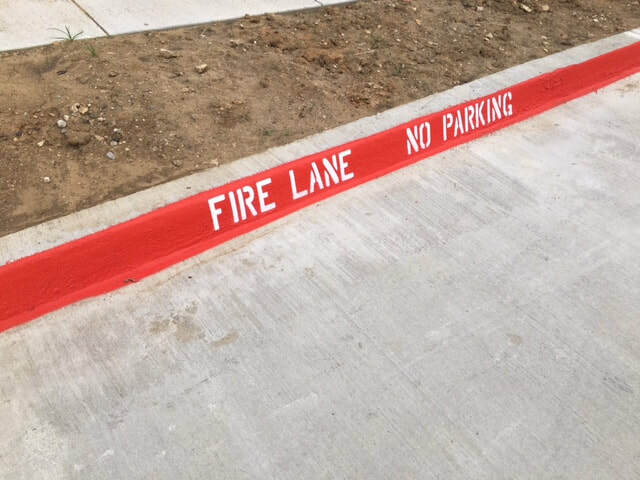 When fire lanes are painted, they will also need to be maintained. Otherwise, you can face getting a fine. It is best for you to be proactive, and keep your lanes painted before receiving a fine. Items in your parking lot such as traffic signs, bollards, and wheel stops should be repaired annually. 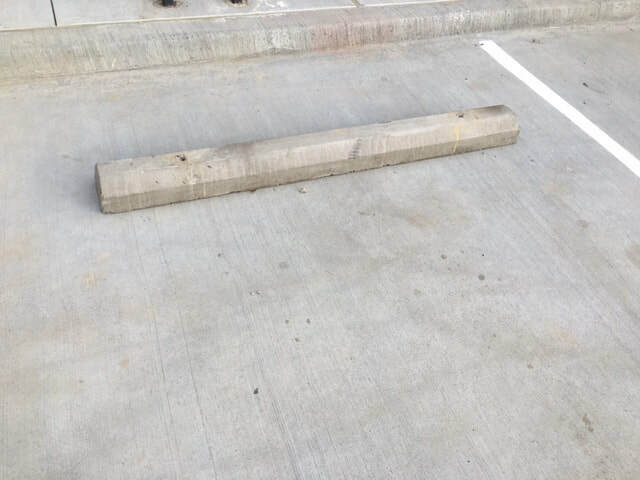 These can become a safety hazard in your parking lot, and when they start to fail, they are typically the first thing mentioned in a lawsuit, e.g., a man breaking his hip tripping on a broken wheel stop. Also, handicap compliance requirements change almost every year. One wrong handicap sign can land you in legal trouble. We take striping seriously, and following codes and compliance are significant to us. You can count on our experts to make sure your business will pass inspection for all fire lane compliance issues. 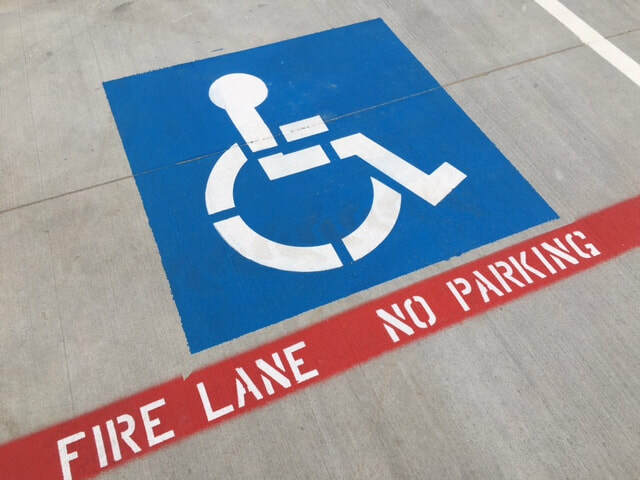 Since the (ADA) Americans with Disabilities Act was signed into place, every property owner is required by law to place a designated parking-lot for disabled persons. Be it a small company or a significant multinational corporation, all businesses premises must have a proper amount of handicapped parking stalls and required van parking space. In addition to that, newly constructed or altered curb ramps for pedestrian walkway must adhere to 2010 ADA Standards for accessible design. ADA requirements are stringent, and the specifications might not be familiar to all business owners, and so it is essential to hire an expert who has all the first-hand details of the requirements. The American Disabilities Act (ADA) requires compliance with your parking lot regarding accessible parking spaces. The ADA went into effect back in 1990, so most everyone is used to this by now. The ADA requires that your parking lot provide handicap parking stalls for patrons that are handicap or disabled. The rules are based on the size of your parking lot, and the amount of utilized parking spaces per 1,000 Sq. Ft. You may also be required to have van accessible stalls as well. Don’t worry about trying to figure out all the rules, because we have that covered for you already. We will ensure that your parking will meet all compliance requirements and that your parking lot will pass inspection after we have completed the striping and stenciling. Wheel stops should be installed in the parking stall so that when a vehicle is parked in the booth, the entire wheel stop is covered by the car. Wheel stops also need to be painted so that they contrast with their surroundings to help prevent tripping by pedestrians walking in the parking area when a vehicle is not parked in the area. Proper lighting can also help with safety issues regarding the wheel stops. Speed bumps have one primary purpose, and that is to force traffic to slow down in areas where there is pedestrian traffic. Enforcing safety in your parking lot is a great thing to do and can easily save lives or prevent accidents. Just like wheel stops, speed bumps should be brightly painted and easily visible. The visibility is a great visual to let drivers know they need to slow down, as well as make the bumps and humps visible for pedestrians walking through the parking area. You also want the speed bumps visible so that vehicles do not hit the bumps at a high rate of speed without seeing them in advance. That would be dangerous and could cause damage to the patron’s vehicle. We offer installation and removal services no matter the type of speed bumps you have or want in your parking lot. No matter what your wheel stop needs are, we can help you to make sound decisions as well. Rubber or concrete, just give us a call today to discuss your project and get a solution that fits your project's needs and budget. ​When was the last time you thought about bollards? Their primary purpose is to act as a physical barrier to protect against vehicle intrusion to specific or secure areas. You will typically see bollards around building entrances, pathways or other pedestrian areas, or exposed utilities. Bollards can also be installed merely to protect buildings or structures in areas that it may be easy for vehicles to run into, such as toll booths accidentally, or drive-thru regions at banks and restaurants. Most common are painted steel bollards. These bollards provide excellent protection at a little cost. Bollard sizes vary from minimal (2" diameter) all the way up to extremely large (30" diameter) and can be placed quickly and with minimal impact to the surrounding area. Once the bollard is set into the ground, it will take approximately one day to let the concrete set. This will make the bollard permanent or temporary depending on your application. Call us today, or inquire via email to find out what bollard is right for you! ​Depending on the purpose for the bollard, you can find different types. Some are made from construction grade steel and reinforced with concrete to provide for maximum protection. Others are used more to merely guide both foot and vehicle traffic along a specific route and keep them out of areas they should not be. These types are mostly decorative and ornamental type designs that can also contain lights to illuminate the area during darkness as well as add to the ambiance of your business. We can even install removable or retractable bollards if you have an area where traffic flow changes often. Sealcoating is a protective barrier that is added on top of your asphalt parking lot to help prolong the life of the surface. This is a protection of your investment of the asphalt surface. Just like any other type of structure, continued maintenance is vital to maintaining the integrity of the surface. When the seal coat is applied, it becomes the actual wearable surface that will break down over time, leaving the real asphalt base unharmed, and in excellent condition. As vehicles drive and turn on the surface, the surface begins to wear down, and this is called abrasion. As abrasion occurs, it occurs to the seal coat, but over time you will need to reapply the seal coat, which is the continued maintenance part. What Will Sealcoating Cost me? Sealcoating your parking lot typically costs just pennies per square foot; compared to a few dollars per square foot needed for asphalt repairs, seal coating is a no-brainer. Some projects require only a few cents per square foot unless they are on the larger side. The best thing you can do is call for a price. Sealcoating will fill tiny cracks and help to weatherproof the surface. If you do not have this production, then water can seep through these small breaks down to the base, which will cause oxidation and deterioration over time, which both will cause damage. Protecting your original investment is very important so that you are not spending vast amounts of money in the future to redo the asphalt surface. We take pride in our ability to make your project go very smoothly; we make the process stress-free from start to finish. If needed, we can notify your tenants ahead of time, as well as post or provide diagrams showing scheduled areas of work. Once your project has begun, work areas will be barricaded off with string and flagging tape for maximum visibility. Your parking lot is vigorously cleaned using high powered blowers and wire brushes and brooms. All oil spots are scraped and then burned off before sealcoat is applied. Once our crews completed your project, we will clean any mess made by our teams during the process. All that your tenants will see is a freshly sealed and striped parking lot when they come to work the next day. ​Local business is the lifeblood of Nashville, and we love to help keep your business, safe, compliant, and looking amazing. Our primary goal is to not only provide you with an excellent service but also to become your asphalt and concrete maintenance service for life. As with any structure, continued maintenance is the only way to ensure that it will last longer and protect your original investment. We work with many different businesses in the area providing excellent service. If you have a parking lot, warehouse, or any other structure that may need striping, we can assist you today. ​As you can see from our website, there is a lot that can go into striping a parking lot safety, and compliance. Once we know the size if your parking lot, and what types of services you need we can give you a FREE quote, so you know exactly what the costs will be. Since every parking lot is different, we must do measurements and calculations to provide you with the bottom line price of your project. Give us a call today, and we will schedule a time to measure your lot and speak with you about the different types of safety and compliance issues you may be facing. Rest assured we do offer the most competitive pricing in the entire Nashville area so you will be getting the best deal available.